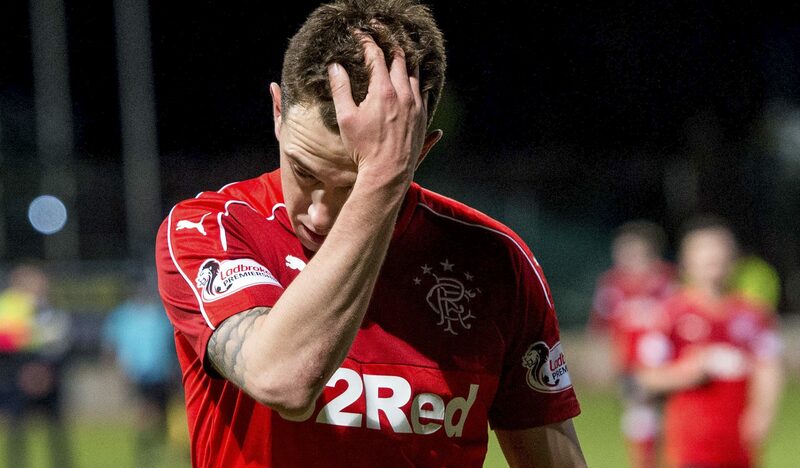 RYAN JACK admits the Rangers support were right to let rip after the Ibrox side put in another “embarrassing” display at Dens Park. The Light Blues faithful turned on Graeme Murty’s men after they followed up last week’s shock loss to Hamilton with another flat performance at Dundee. Mark O’Hara’s double gave the hosts a 2-1 win and midfielder Jack confessed his side have no excuses. “It was embarrassing to be honest,” the former Aberdeen skipper told the club’s Twitter account. “There’s no way we can hide from it. “It’s so frustrating as players, as a group. It’s just not good enough. “We’re letting everyone down. We’ve also let the fans down. What a support we had through today and they are right to show their anger and frustration at us. “As players we are feeling it but it’s not good enough. “The goals [we conceded] aren’t good enough. The overall play, I don’t think we’re doing enough to win the game. We were too open. There were too many gaps for Dundee, especially in the middle. Gers missed out on the chance to overtake Aberdeen with their Tayside slip-up and now face a crucial double-header with the Dons this week. Meanwhile, Cammy Kerr hopes Dundee’s surprise win is the turning point that spares the Dark Blues from relegation danger. Neil McCann’s Dens Park outfit had won just two Ladbrokes Premiership games before Friday’s visit of Gers. But their victory has restocked the top-flight basement boys’ sagging reserves of confidence and now Kerr hopes it can inspire them to a better run of form. The Dundee vice-captain said: “We’ve been waiting for a result like that for a while. “Our performances have been there for all to see this season but we’ve just not got the results. “So to finally get a gritty, determined performance and the result was great. “Hopefully this can be a springboard for us to start climbing the league. “We want to look back at the end of the season and realise this was a big win. It really is a great result and everyone in the dressing room was buzzing. O’Hara has now netted four goals in his last three Dens clashes with Gers and Kerr admits his team-mate relishes facing the Glasgow giants. “I said to Marko he must wish he could play Rangers every week,” joked the defender. “Every time he faces them here he seems to score.